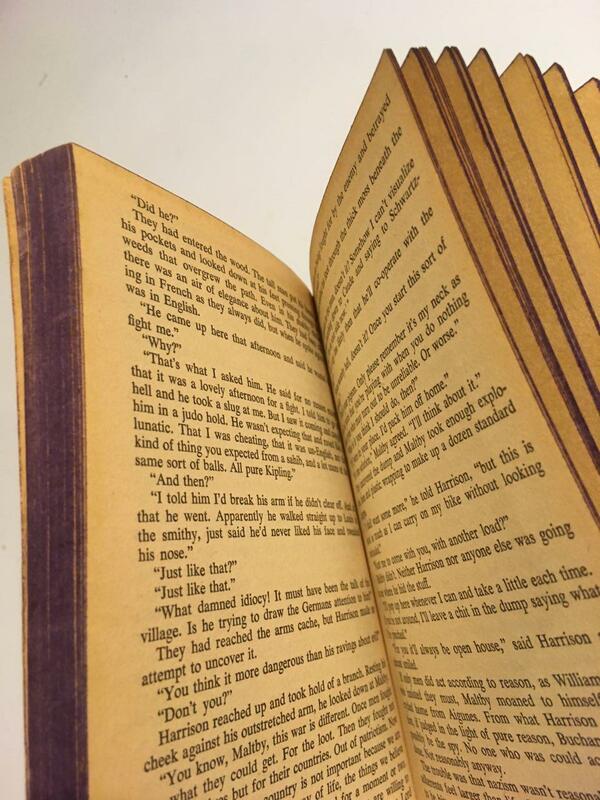 I quite like the sombre colours and purple edges of this paperback. It was in very good condition when I got it, perhaps only read once by the previous owner. Two days of reading by me has left it in a much more "used" state. I was pretty careful but I guess just the age of the paper and glue means that any movement creates lines and little degradations. 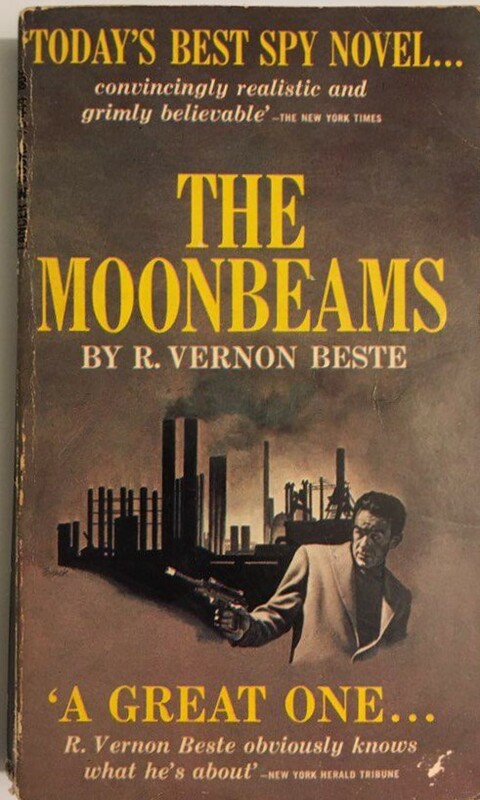 I thought it was an American crime novel when I picked it up, but it's actually a British WWII spy novel, specifically about agents working the ground in rural occupied France near the end of the war, allying with the resistance and communists. The protagonist, Maltby, is cynical and bitter, but also kind of lost. The book begins with him back in London after a debilitating ulcer forced him out of the France where he had worked with a small team of 5 other spies, blowing up industrial sites and spying on the Nazis. Although he could have had his "ticket" to take the rest of the war off, his own anxiety about who he is allows him to be convinced to return. His handlers learned that one of his crew was a double agent, working with the gestapo and was getting ready to blow up the entire extended network. They send Maltsby back to find out which one was the traitor and also to blow up some crucial and irreplaceable machinery (because it was manufactured in Britain before the war) in a ball-bearing factory. This is really more of a war book than an espionage book, though technically it's all part of espionage. Most of the narrative takes place in France in this one region where Maltsby has been operating. I found the detail of the way they managed themselves and planned their actions to be really interesting. I don't know how realistic it is (there seemed to be quite a few englishmen who could succesfully pass as working class or peasant frenchmen, but perhaps to the Germans such a disguise would be more effective). It was also near the end of the war and German forces were weakened, distracted and low on supplies. 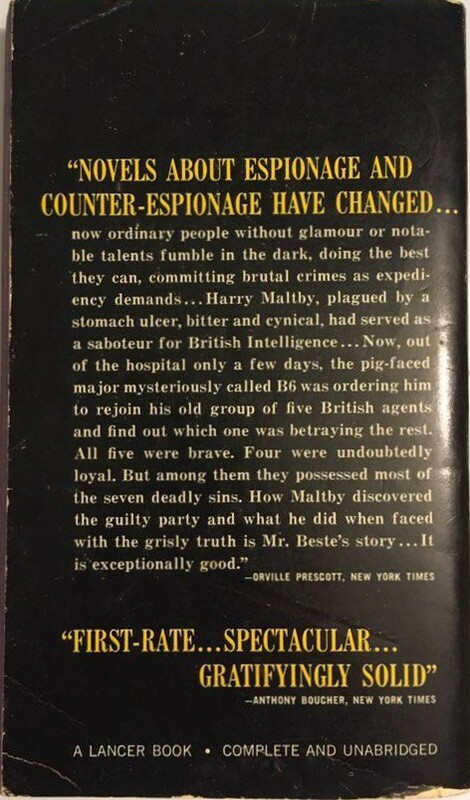 There is also some really interesting social exploration, as Maltsby gets to know each of his fellow spies in a new way now that he suspects them of betrayal. In particular, he discovers that one them is homosexual and he is disgusted but doesn't want to be, as his own innate prejudice clashes with his theoretical liberal values. Though I am always a sucker for the happy ending, given the darkness and anxiety that makes up most of the book, I found the way this one concluded a bit pat. Likewise, I guessed the traitor quite early on and found Maltsby's mistake somewhat difficult to believe. These are minor complaints about what was otherwise a solid and engaging story set in a well-portrayed and complex milieu. Basically a really good resistance story.